While office managers are often the biggest champions for keeping their offices environmentally friendly, many may not be aware that being eco-friendly now goes far beyond recycling bins and reusable water bottles. But building a greener office is something we all have a stake in — and you can help your office manager become an even better eco-warrior. Here are five questions, courtesy of Jake Swenson, director of sustainability at Staples Business Advantage, you can ask your office manager to help encourage him or her to stay up-to-date on the latest environmentally conscious policies and products — from breakroom to bathroom. What are we doing to reduce office waste? Waste reduction is the cornerstone of any office’s green policy initiatives. One key way to minimize waste is to reduce the use of single-use plastic products such as cutlery, straws and cups. Instead, your office manager should consider investing in more permanent products, like real silverware and ceramic mugs. 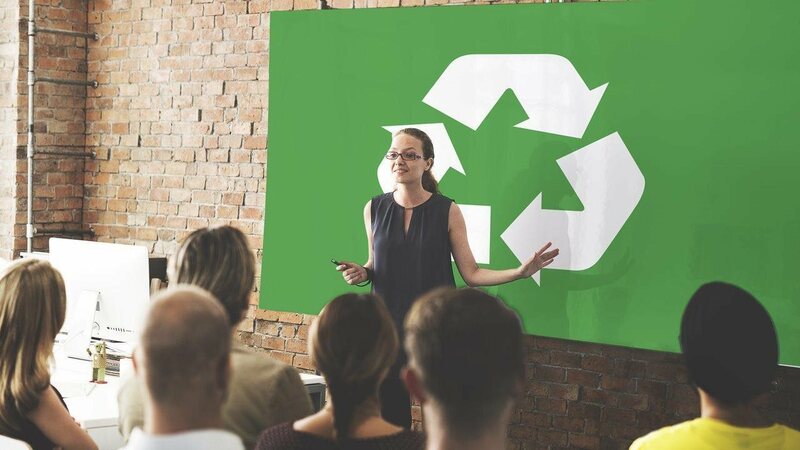 If workplaces are serious about being more environmentally friendly, office managers should also implement comprehensive recycling programs that go well beyond paper and plastic. For example, many basic components of an old computer can be reused once it is broken beyond repair, and batteries can be recycled to avoid releasing hazardous chemicals into the environment. What types of cleaning products are we using? It’s not just about using fewer products, but also about the products you’re using. Biodegradable, non-toxic products and cleaners have been extensively researched and many perform as well, if not better than, their less-green counterparts. And the impact of using these eco-friendly cleaners extends beyond their immediate ability to disinfect a surface — cleaning products that are free from alcohol, ammonia and phosphates are friendlier for the environment and are often much less harsh on people. If offices are not thoughtful about the kinds of cleaning products they are using, they could be using products that negatively affect the office air quality and create odor pollution. Are we purchasing sustainably sourced, healthy snacks and beverages? Being green can apply to office snacks, as well. For example, ethically sourced fresh produce can provide both a healthy and sustainable option, and fair-trade coffee and teas can support the environment without requiring workers to give up their morning caffeine fix. And while purchasing these kinds of products may not directly impact your office’s waste generation, eating and drinking them benefits the environment at a more macro level and may be encouraging your colleagues to shop green and healthy outside of the office. What are we doing to conserve energy? Reducing energy usage is one of the easiest ways that offices can become greener, and small changes in behavior can add up to big changes for the environment. By simply having the last person in the office turn off the lights each night, companies can significantly reduce energy consumption. During the day, offices should also take advantage of natural light, as this can have a real impact on your organization’s monthly power bill. Another easy way for an office to conserve energy is to remind employees to turn off their computers before they leave for the day or switch them to standby mode. How are we encouraging employees to be green outside of the office? Office managers have the ability to help implement environmentally focused policies that extend far beyond the walls of your office. You can work with your office manager to organize events encouraging your colleagues to participate in volunteer work centered on the environment, such as an outing to clean up local parks and green spaces. These types of volunteer-focused events are not only good for the environment; they are also morale boosting. Your office manager can also help you champion donation matching initiatives for an eco-friendly cause. Building a more eco-conscious office doesn’t have to be difficult. Simple changes can make a big difference — now and further down the line. Opening an ongoing dialogue with your office manager regarding your company’s sustainability efforts will get you well on your way to helping your office turn over a new "green" leaf. For more information on eco-friendly products, visit StaplesBusinessAdvantage.com.